I am still sorting out my hundreds of photos of birds from our Florida trip back in February. But this week’s Daily Post Photo Challenge theme, “Close”, has prompted me to marvel at how closely I was able to approach many of the birds. 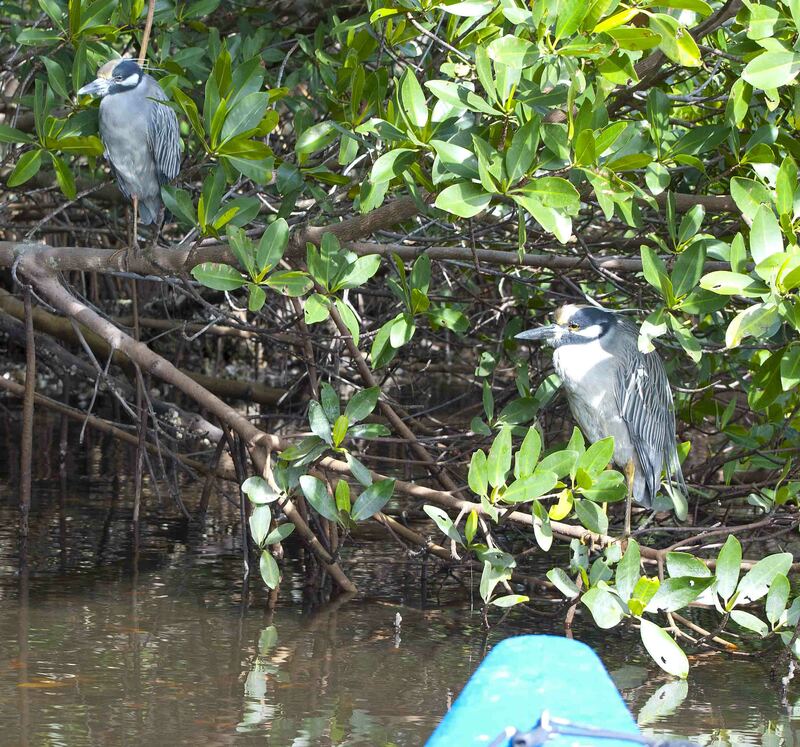 I rented a kayak and paddled through the mangroves. The birds perched in the tree tops—some of the trees were absolutely festooned with birds, like some kind of fruit—and looked down at me nonchalantly. 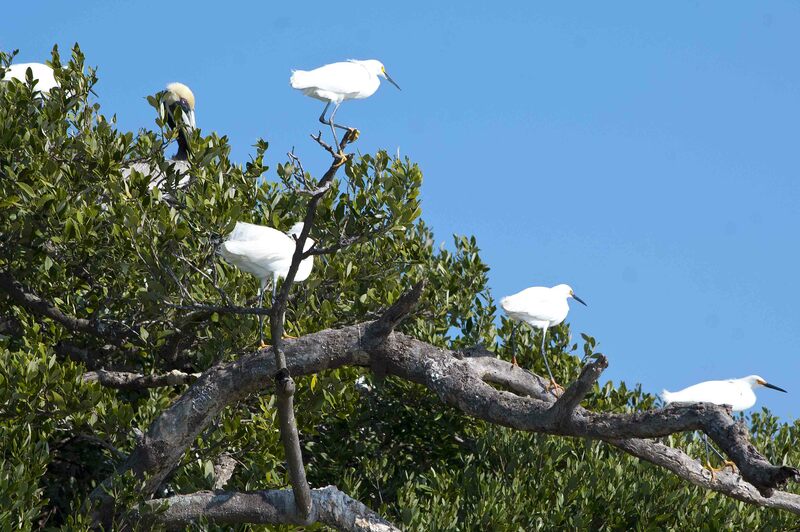 Other birds stood on low branches projecting strategically out over the water. These two just looked at me stolidly, even though I was so close that my kayak was actually bumping into their branch. I could have picked them up with my hands. And so I was able to get some good shots of the various birds. I have a reasonable idea of what many of them are—some are unmistakable!—but identification by experts would certainly be appreciated! Some other bird photos from that trip are here, here, here, and here. 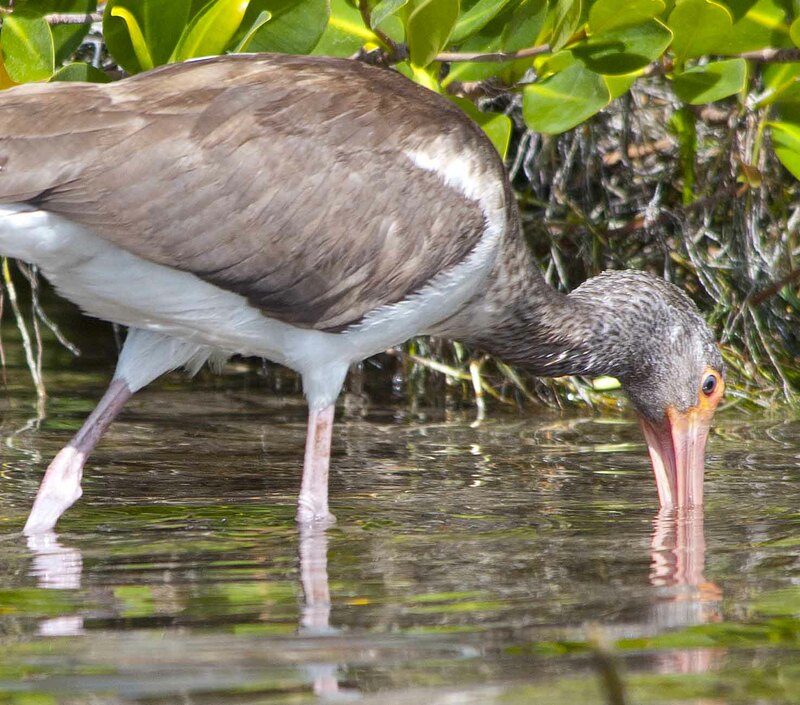 This entry was posted in Nature and tagged Birds, Florida, Florida Kayaking, Kayak Photography, Kayaking, Photography. Bookmark the permalink. Well, most of these photos were taken with a telephoto zoom lens zoomed out to 300mm. That was great insofar as I could capture the details of the birds well. But there was often some fuzziness about these shots taken from the kayak, but not those taken from land, making me think that at that magnification the motions of the kayak interfered—as you would expect, even though the water was pretty calm. I will look out for your FL post! Your photos were close-ups which someday I will be able to do as well thanks so much for checking it out! 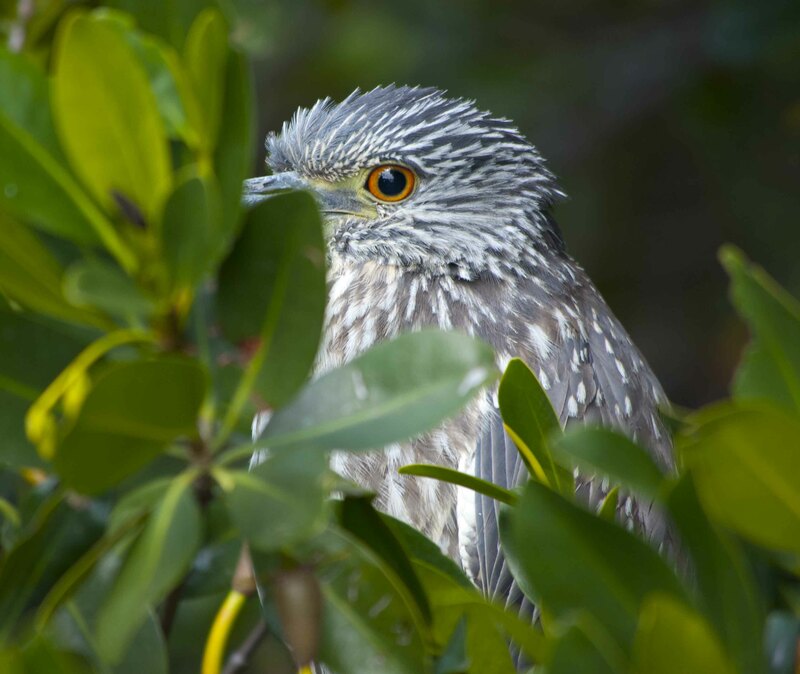 Photos 2 and 3 are of Yellow crowned night herons , 4 and 5 are immature yellow crowned night herons . I love watching the herons fish ,stealth is their game : ) . 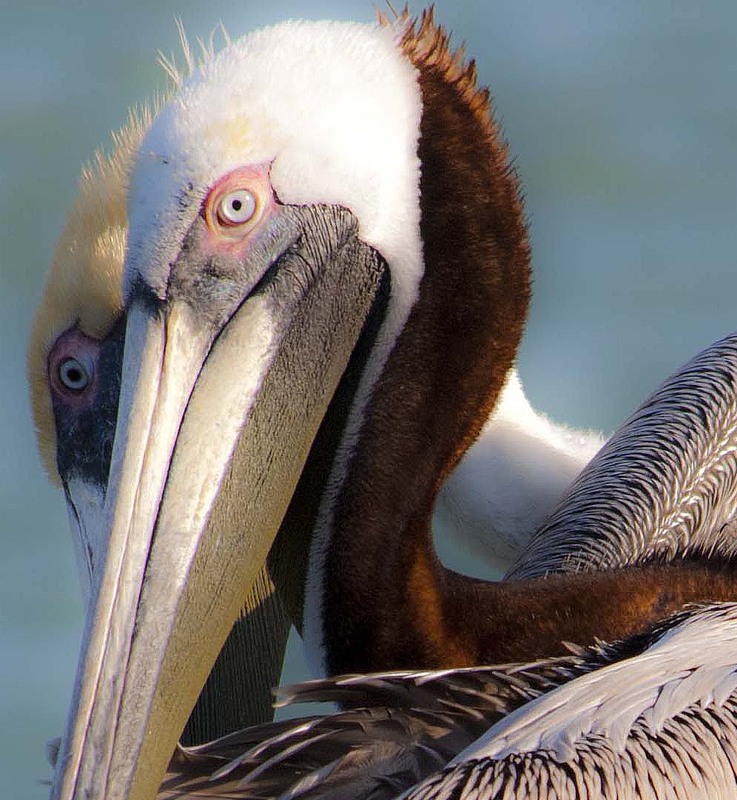 The Cajuns used to harvest them for their breast meat but I believe their a protected bird now . Nice details in the photos . Thanks, Stephen! Yes, I was pretty sure that the adults were yellow-crowned night herons, but wasn’t sure about the juveniles. What about black-crowned night herons? As I understand it, the juveniles of the two are hard to tell apart. 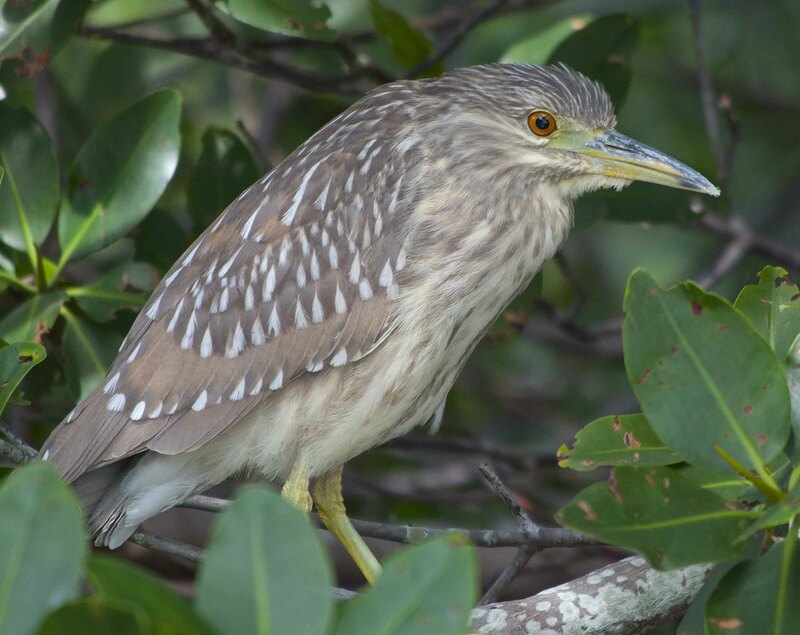 Do black-crowned night herons even live in that area (Gulf coast of Florida)? Seems so http://www.allaboutbirds.org/guide/Black-crowned_Night-Heron/id . I remember observing these Black crowned night herons as a kid and thinking that they had a sinister look and movement to them as they hunted lol . The Belted kingfisher is another favorite http://www.allaboutbirds.org/guide/Belted_Kingfisher/id . Fantastic shots. The last one is my favorite. The brown feathers on its neck look so soft. I wonder what it was thinking. The problem of other minds… Thanks, Honie! Your photos make me glad I got an iPad! I do hope that’s a compliment, Janet! Thanks so much for visiting, liking, and reblogging! What a great assortment of bird close-ups! Just wonderful! I focused on the close-ups in this post. Many more photos are of somewhat lower quality (taken from further away, usually) so that they don’t provide adequate close-ups, but still show the whole bird well in its environment… I’ll post those later! The second picture is of blue herons. 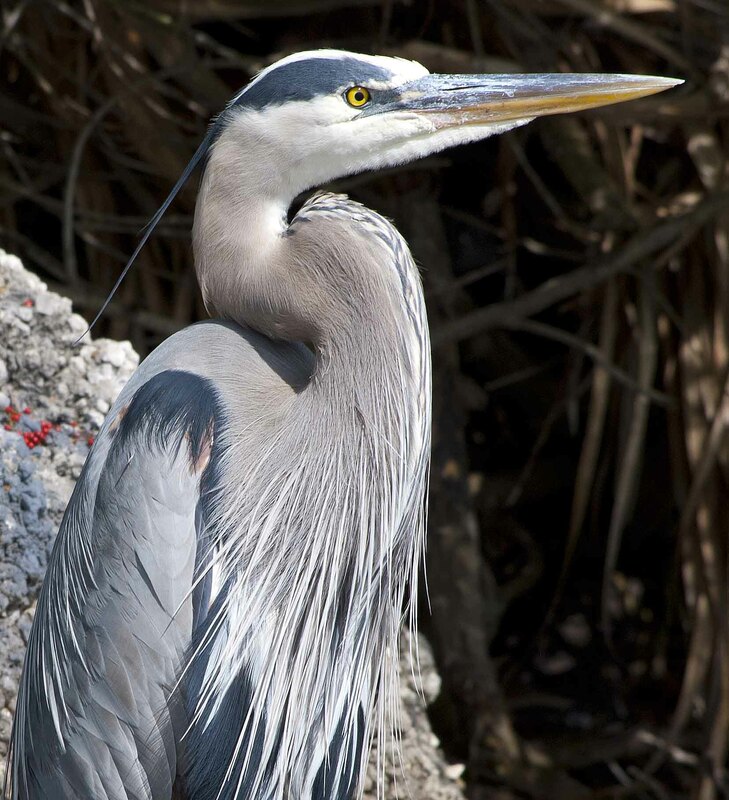 The 9th photo is a great blue heron. Vlad, these are great! Years ago I was canoeing in Florida. As you’ve shown, the birds are wonderful! Thanks for the lovely photos and for giving me some good memories! The birds don’t change over the years :-) Thanks, Cathy! I love them all. I once painted a picture like the white bird. After seeing yours, my bird has a big neck. I think I will throw my painting away now. I used to watch those birds all the time when I lived in Florida. Birds were all over the place, wherever one looked. Especially herons! perfect portraits of these characters! Either that, or I had a big telephoto lens… a bit of both, actually! Beautiful! Have you seen some alligators, too? No alligators, although we were in some prime alligator territory. I was hoping! In fact, I haven’t seen an alligator in the wild yet. But I did see three manatees, and a number of dolphins of course. You are so lucky to have had the opportunity of being so close to them. Great photos, with amazing details! 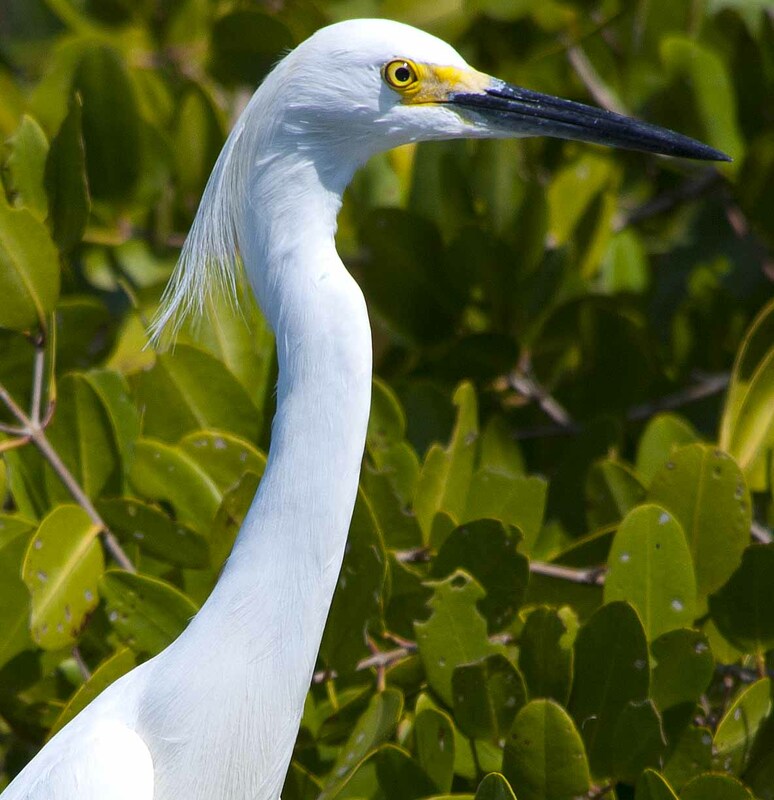 Great shots of the yellow-crowned herons and juveniles. 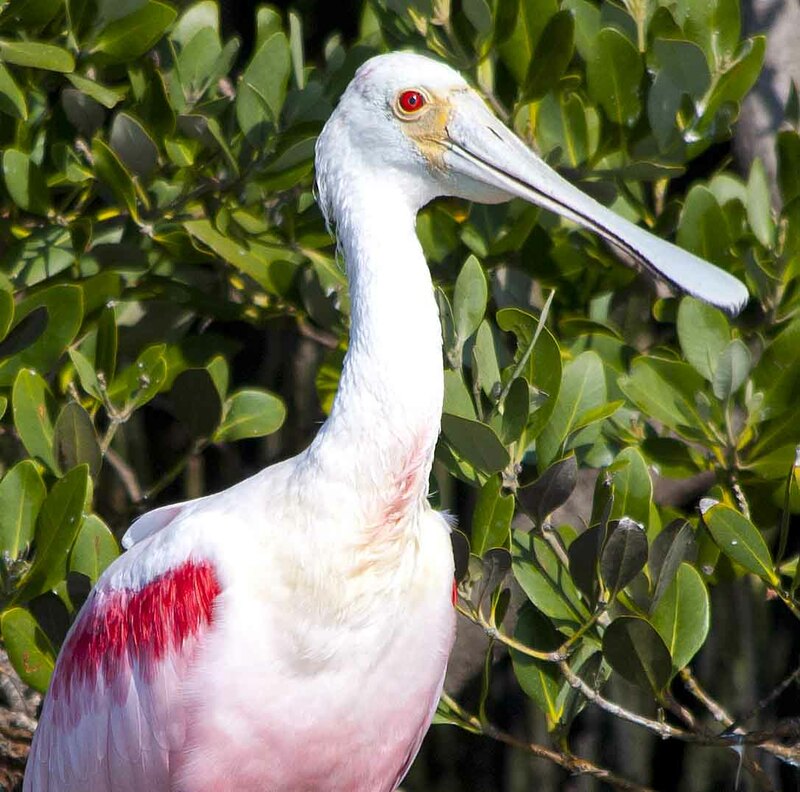 And you even captured a roseate spoonbill! 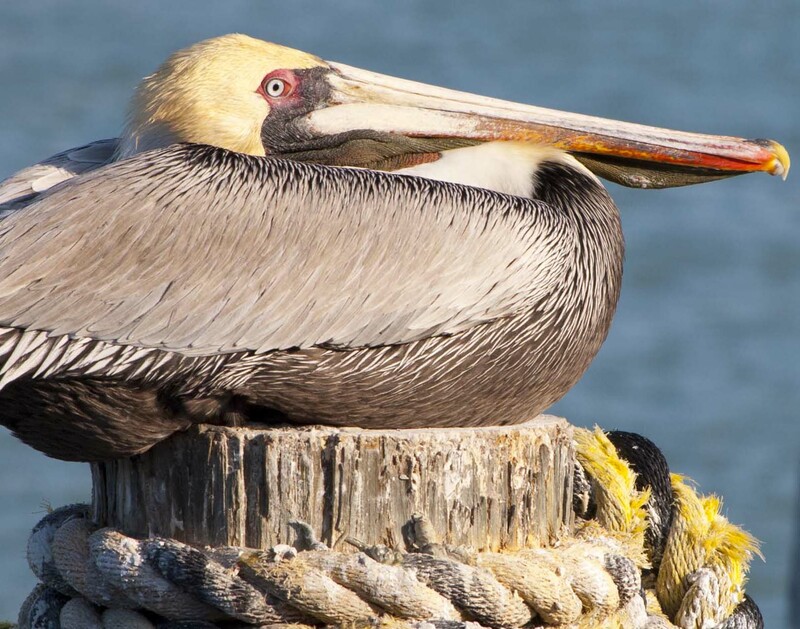 And have to love the pelican-on-piling shot. Well done. Nice way to see Florida. There were several roseate spoonbills—I thought they were rare, but they didn’t seem to be especially rare in that area. A very nice way to see Florida—for me, certainly! Count your blessings! In nearly seven years down there, did not see ONE spoonbill. Wow! Keep lookin’! All those things that look like logs in the water probably aren’t. We’ve even seen gator roadkill in West Palm Beach. (Must’ve been hit by a semi). We’ve even seen them lollygagging in little pools that accumulate inside the loops of highway clover leafs. I’ll keep looking! Part of the problem is that when I go to Florida I spend a lot of my time in some air-conditioned hotel or conference center, not exactly prime alligator habitat…. 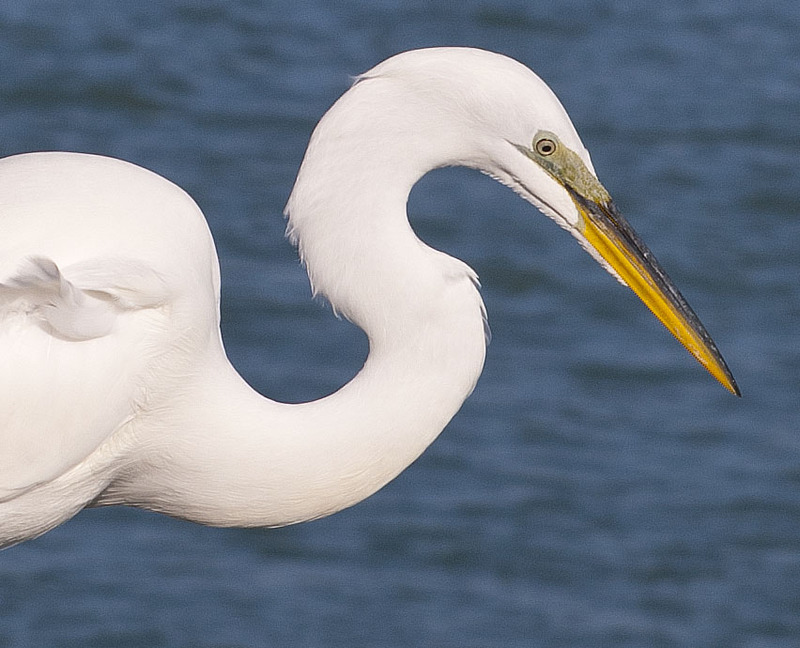 Stunning photos of these birds! Thanks, Steve! That’s a great picture you’ve got there (and a great blog!). 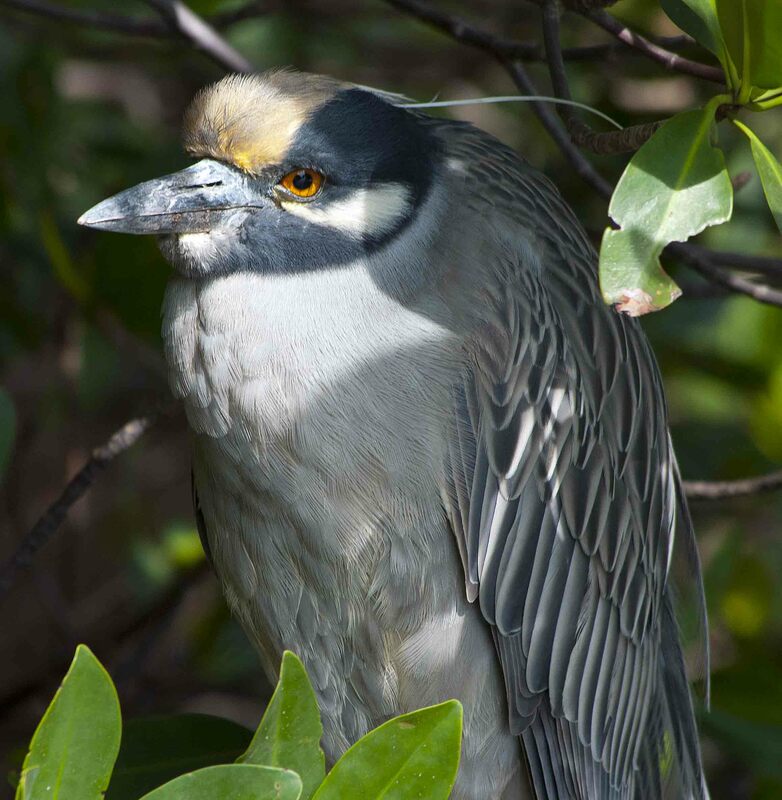 I don’t know much about birds, so I was surprised to learn that the yellow-crowned night heron is found as far inland from the Gulf of Mexico as Austin, including right in my neighborhood. :-) And they are even seen here in NYC! Each bird was striking a pose like a pro…:) I enjoyed these photos very much! Thanks for following our blog—lots more to come! Really nice! What Equipment did you use? Nothing very special: a Nikon D80 with the AF-S Nikkor 55-300mm lens, mostly zoomed out to 300mm… and a kayak, for getting really close! And I do like your cherry-eating birds! Thanks! Beautiful photos, especially the really close up ones!